Hillbilly-Music.com - Will You Miss Me When I'm Gone? Will You Miss Me When I'm Gone? is the first major biography of the Carter Family, the musical pioneers who almost single-handedly established the sounds and traditions that grew into modern folk, country, and bluegrass music—a style celebrated in O Brother, Where Art Thou? A. P. Carter was a restless man, seemingly in a constant state of motion. On one of his travels across the sparsely settled mountains and valleys that surrounded his home in southern Virginia, he met and married a young girl named Sara Dougherty. Orphaned as a child, Sara was remote by nature but seemed to find release in singing the typically melancholy ballads that were a part of her home tradition. For fun, A.P., Sara, and her cousin Maybelle (who married A.P. 's brother "Eck" Carter) would play and sing the hymns and ballads known in their Poor Valley community, occasionally adding songs A.P. had collected during his travels. Then, in 1927, they traveled to Bristol, Tennessee, to audition for a New York record executive who was hunting "hillbilly" talent and offering an amazing fifty dollars per song for any he recorded. These Bristol recording sessions would become generally accepted as the "Big Bang" of country music, producing two of its first stars: Jimmie Rodgers and the Carter Family. By the early 1930s, the Carter Family was the most bankable country music group in America, with total sales of more than a million records. By the late '30s, they were appearing regularly on high-power radio station XERA, which broadcast from coast to coast. A whole generation of country people could gather around the radio and hear the sound of music that came straight from their world. Johnny Cash in Arkansas, Waylon Jennings in Texas, Chet Atkins in Georgia, and Tom T. Hall in Kentucky all listened to the Carter Family. It was their formal schooling, Country Music 101. Inside the Carter Family, however, things were hardly perfect. Though nobody outside the family knew it, Sara had left her difficult and quixotic husband in 1933. In 1936 she won a divorce. Even throughout the long and painful breakup, the Carters kept performing together singing an ever-widening range of new songs they wrote or old songs they remade: songs of love, of betrayal, of the death of fondest hopes. And they kept at it even after Sara married A.P. 's cousin Coy Bays in 1939. After fulfilling a final radio contract in 1943, Sara and Coy moved to California to settle near his family. The original Carter Family never performed or recorded together again. With Sara gone, A.P. retreated home, opened a general store, and lived out the next two decades in obscurity, the odd man out in a new and reconfigured Carter musical clan. Meanwhile, Maybelle and her daughters (Helen, June, and Anita) went out and got themselves new radio contracts, working in Richmond, Virginia; Knoxville, Tennessee; and Springfield, Missouri, before ascending to country music's ultimate stage, Nashville's Grand Ole Opry. Nearly fifty years in the business won Maybelle the title "Mother of Country Music" and the adoration of generations of guitar players and just plain listeners. 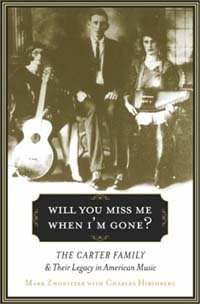 The story of the Carter Family is a bittersweet saga of love and fulfillment, sadness and loss. Will You Miss Me When I'm Gone? is more than just a biography of a family; it is also a journey into another time, almost another world. But their story resonates today and lives on in the timeless music they created. MARK ZWONITZER is a writer-director whose work appears nationally on public television. He is currently finishing up work on a documentary about the creation of the transcontinental railroad and hopes to begin work soon on a documentary about the Carter Family. He lives in Connecticut. CHARLES HIRSHBERG, an editor at Popular Science magazine, is the author of Elvis and The Beatles. He lives in New York City.